Chicago made history electing former federal prosecutor Lori Lightfoot, defeating Toni Preckwinkle in a runoff for Chicago mayor Tuesday. Lightfoot will be the first openly gay person and first black woman to lead Chicago. 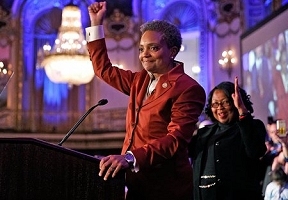 Surrounded by a crowd of supporters at the Hilton Chicago Grand Ballroom, Lightfoot cheered and thanked Chicago for their support. According to the Chicago board of elections website, Lightfoot gained 73 percent of the votes compared to Preckwinkle’s 26 percent. “In this election Toni and I were competitors, but our differences are nothing compared to what we can achieve together,” said Lightfoot. “Now that it’s over, I know we will work together for the city that we both love. Today, you did more than make history. You created a movement for change.” Lightfoot, 56, who was an assistant U.S. attorney has never held elective office before. 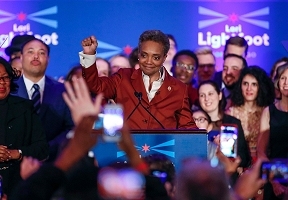 Photo Caption: Lori Lightfoot makes history in a landslide win becoming Chicago’s first African-American woman mayor-elect.